The program is tailored for each individual horse and their person. Regardless of what the horse is here for, be it for, trailer loading, bucking, biting, rearing, spookiness, helping a previously abused and un-trusting horse, putting on riding miles, atrocious ground manners, starting or re-starting or other issues, we will begin with building a relationship on the ground first. This can take 1 session or several depending on where the horse is at. Doing this builds confidence for the horse and helps them feel secure, safe and relaxed with us which is necessary for thorough learning. I'll be looking to see if there are any areas on the ground that need addressed before progressing as what you have on the ground lays the foundation the rest of their education. I expect a horse to operate off of a feel, to be light, willing, thinking as well as listening to their handler for guidance and support. This program includes a variety of different environments and circumstances, some predicted others are a surprise, such as an encounter with elk or dirt bikers. Basic ground work is assessed and established in the round corral and arena. For a horse being started, this includes leading, picking up their feet, tieing. Depending on where the horse is at and if they are being started initially, l will begin with hand walks and ground driving in the hay field and on our trail here on the property. The fence line to the trail here can be huge obstacle in itself. Riding lawnmowers, horses in a neighboring field they weren't aware of that gallop up to the fence, barking herd dogs that come running up out of nowhere, not to mention the herd back home neighing at them, which, depending on the horse and where they are at can be quite a distraction. THEN, we are at the trail system. I'll then start ponying from an experienced horse. Trailer loading will be assessed and if there is work to be done there, that's what we'll do. The horse needs to be able to load and haul in the front with the divider open or closed as well as in the rear of the trailer, closest to the door. They need to be able to load and haul by themselves and with other horses with ease. I'll pony or ride in a group setting with them in the rear, middle and 2nd from the lead (if ponied) and in the lead. They will learn to tolerate a horse on their tail as well as on another horse's tail and to behave themselves. We will ride the horse away from the group and met up later and vice versa. We will ride away from the other horses and have the horse we're working wait while others gallop away. If I'm starting or restarting, before I ever get in the saddle, your horse will have experienced just about everything riding related short of the rider being on their back. Starting involves accepting the saddle and all the gear, rear cinch, breast collar and things flopping around on the saddle. ​They should be lunging and round penning through all their gaits: walk to canter to slow trot to fast trot, back to slow trot to walk, stop, canter, walk etc. with just a subtle change in body posture that will be hardly noticable to anyone not knowing what to look for. They'll be ground driving so they will already have a rudimentary steering wheel, know how to turn, stop and back up with two reins. The horse should also understand lateral flexion and be properly moving their hind quarters and front quarters. It's my hope and expectation that the owner actively participate in at least one session per week. Consistency is so important and every one needs to be on the same page for success. This is a good place to note that no horse is ever fully 'trained.' Poor handling once the horse gets home and everything could unravel pretty quickly. And I do not consider myself a trainer but use that word for lack of a better one. I expect when handling a horse to ALWAYS be in communication with it. That means we do not want the horse to mindlessly go down the arena rail and into the corners because that's what they have been 'trained' to do. They go down the arena rail and into the corners because that is where the rider is telling them to be. This means that the rider is ALWAYS in control and in communication and feeling of the horse, focused and fixing and correcting as necessary. Once you can do this in the arena, move to doing this outside in a small field. Once comfortable there, then you might feel comfortable moving on to riding in a 20 hay field, or other large open space and know you have control of the situation because your horse is listening and you are guiding. AND that you know what to do if the horse misbehaves and are able to get as firm as needed for the situation and then go immediately back to being soft once you get the change. The rider or handler needs to understand how to communicate consistently in a meaningful way with the horse. And it's a dialog, a two way conversation. The horse will sometimes ask, in their way, "is this what you meant?" As humans, we need to be able to understand and read this language the horse presents to us and be able to respond with a kind, understandable and supportive answer. Learning to control one's emotions and be completely in the moment, as much as possible will be essential. It's also important to note that getting all of this described here takes time, I might be able to get your horse to do all or most of this for me in a short time, but it certainally won't be old habit for the horse yet. They will have been introduced to alot but then it takes repeated exposure and 100% consistency for the horse to solid in any of this. If there are any hang ups along the way, something your horse is having a more difficult time with that I need to spend some extra time on, you'll know about it. Each horses path in learning is different. My program is priced by sessions, $30 per session and the owner is strongly encouraged to participate, however we know that might not always be possible. With sessions you know exactly how many days your horse is being worked and notes on how each session have gone when the owner is not present are emailed regularly. This is a good choice if we are working on a specific problem, doing a refresher, easing a horse back into work after time off and they aren't physically ready for full training or things like that. We can also do a monthly training price of $550, which will equate to a full training schedule. The horse will also benefit from the regular routine and goings on here while living at Breezy Valley. Learning how to live in a natural, herd environment and how to speak horse, and each time we handle the horse, no matter how briefly, be it leading from the pasture to the barn at night, will be a learning opportunity. Payment for the upcoming training and boarding in a given month and signing of all paperwork is expected upon the horses arrival. Individual lessons on your own horse, not part of the training program: $35. Horses available for lessons if you don't have your own. 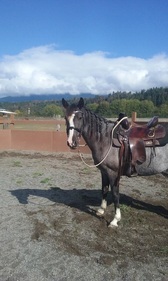 Willow was a very green, spooky mare with less than 15 rides from 2 years ago when she arrived. This is after 2 ground work sessions and 3 arena rides. She's calm, confident and enjoying herself the outing and new experiences.